For many years, it was thought a simple layer of spray-on or roll-on membrane was enough to make a masonry block foundation waterproof. We've learned over the years that that's simply not the case. Block foundations present some challenges for architects, builders and contractors. Every seam between blocks represents a potential path for water. The porous nature of the block means water can actually be pushed through the block itself given the right (or wrong) conditions. To make a foundation of any type truly waterproof takes a multilayered approach. For instance, start with Mar-flex LiteFUSION, an economical water-based acrylic waterproofing membrane that's great for use when hydrostatic pressure exists. It can bridge cracks that might later develop in a foundation, and can protect from the dangers of moisture, which can cause mold and mildew. 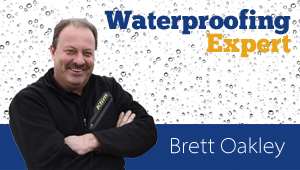 It's specifically designed for waterproofing pre-cast, poured and masonry foundation walls. Mar-flex Lite FUSION is a spray-on membrane, so it dries as a seamless, monolithic coating. It has no odor and will dry to a gray color to blend with the color of concrete. Then add a Mar-flex drainage board to help drive water away from the foundation. The drainage board also protects the membrane during backfilling and throughout the life of the home. Some drainage can also add insulative value to improve energy efficiency and comfort. Unlike basic damproofing, a waterproofing membrane is designed to stop water infiltration and be extremely effective when applied on the exterior of a foundation system. While a block foundation is usually fast and inexpensive, cutting corners in waterproofing can lead to problems during the life of the structure. Paying attention to details in waterproofing will pay off for the building professionals as well as the building owner.